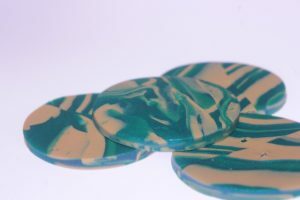 Our beautiful range of buttons are made from the hardest polymer clay to give a stunning effect together with a practical button that can be used on garments and craft projects. When you buy our buttons you can be confident that there won’t be any other buttons like them. Through creative play with the polymer clay, we make unique buttons. Only the plain, single coloured buttons can be replicated. All others are as individual as you are.